Musicians invest more than money into their instruments. There is often a long search before finding the instrument that suits us, and through all our struggles together, a bond is formed through physical and emotional investment in a working relationship. As with all investments we take precautions to protect them from loss. Insurance is wise , but only compensates us for the loss of the tangible financial aspect of our instrument. The problem for musicians is how to secure their intangible assets. There are two aspects to this problem. Instruments are stolen, and stolen property is seldom recovered, so we need to discourage theft, and encourage return if stolen. Criminologists tell us that three factors must be present for a crime to be committed. A motivated offender, A high level of opportunity, and a low level of deterrence . To defeat the motivated offender we need to reduce the level of opportunity and to increase the level of deterrence, which is where property marking systems work so well. Thieves are discouraged from entering buildings or removing property which advertises itself as being security marked. Such property, if stolen, would be harder to sell and of lesser value. This deterrent effect seems strong even when the level of opportunity is high. In 2001,according to the UK Home Office Crime Reduction Unit, only about 9% of stolen property was returned to owners. A Police spokesman estimates that this figure is now about 14%, but Police Property Store Managers face a difficult task, with limited storage for increasing quantities of generally untraceable property. None of this can be retained beyond twelve months, and the average storage is about three months. Security marking systems which positively identify owners, would make it easier for the Police to return our property as well as aiding in prosecutions for theft. As experts in crime fighting and prevention, and the most likely agents for the return of our stolen property, the views of the Police on security marking systems must be regarded as authoritative . “Secured By Design” is a crime prevention initiative by ACPO (the UK Association of Chief Police Officers), which “focuses on crime prevention at the design, layout and construction stages, and acts as an accreditation body for security marking systems, and while there are many , only three systems are currently accredited in the U.K. It is these which are described below. Many of these companies and much of the technology is new and therefore attracting a lot of interest and competition. I suspect that in a year or two the market will have rationalised into a smaller number of strongly differentiated market leaders. In the meantime, it is obviously wise to adopt the recommendations of the experts and to choose a system in whose use, the Police are trained and which they are equipped to detect. All the systems described are available worldwide, although other systems may have local preference. It is always wise to check with your local Crime Prevention specialists to ensure that your chosen system is supported by your local Police. All these materials are packaged in small bottles with applicators, rather like mascara bottles, and the quantities dealt with are small. 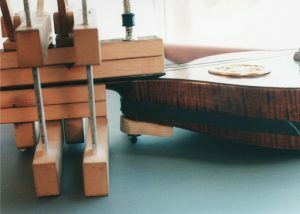 Tiny dabs are sufficient, usually in undisturbed areas such as inside the pegbox or underneath the fingerboard, so there is little risk of contamination. If the skin is marked or spillage occurs, the material can be removed with soap and water, although once dry it is not transferable and cannot cause contamination. Some companies recommend the use of gloves. This may be familiar as a product supplied by a leading musical instrument insurance company. It consists of a chemical trace product, whose chemical formulation is unique to each customer, combined with a fluorescent marker and a permanent adhesive, so that when applied to rough or porous surfaces, it is difficult to remove all traces. This can subsequently be detected with ultraviolet light, although it is necessary to have the sample analysed by Smartwater, who store information on a secure database. Customers are not charged for this service. Warning signs and labels are used to advertise the presence of security marking. Smartwater is PH neutral and is described on its Safety Data Sheet as a Non-hazardous water based polymer emulsion containing low level additives. There is UK nationwide support from the company’s Police Liaison Team who are all highly qualified former Police officers. There is also a 3-part crime prevention strategy named S.A.S. meaning- Standardise, Advertise, Sustain, which aims for a single operating procedure to identify suspected stolen property, with formal training programmes, thereby removing confusion and making consistent checking of property easier. The advertising includes T.V. Radio, Press, posters in custody suites, street signs and warning signs in houses, all aimed at potential thieves. This strategy is sustained by using Smartwater in Police covert operations, which gain publicity and demoralise thieves, installation of U.V. equipment in custody suites with posters for prisoners. Also U.V. searchlights to be used in conjunction with search warrants, routine checks at car boot sales, second hand dealers etc. The Police are also equipped with U.V. key fobs and searchlights. Smartwater is paid for by annual subscription equivalent to £4.99 per month. This material makes use of the almost infinite numerical permutations possible when a strand of DNA is sequenced. In this case the DNA comes from a calf’s thymus, but no biological material is used in the product, only the numerical sequences which result. This information (or synthetic DNA) which is unique to each customer is encoded into a water based adhesive which contains a fluorescent marker and thousands of microdots imprinted with the free phone number of the database and the customers unique number. The presence of SelectaDNA is indicated by U.V. light and the microdots can be read under X100 magnification, positively identifying the owner and linking suspects with crimes. As with Smartwater, the material may be regarded as an adhesive with low level additives. In this case, a water based acrylic-urethane coating, described as non-hazardous and stable. According to Chris Taylor of Selectamark, “it has been tested by an independent Forensic lab….on motorbikes for durability in all weather conditions”. There is also a strong emphasis on deterrence with SelectaDNA being supported by labelling, warning signs, advertising, and active checking for marking by Police . There is a one-off charge of £49.00 in the U.K. and analysis is free if carried out by the Police or £100. For commercial purposes. This can take 2 to 3 days. The technology behind this product is highly secure and is used in approximately 60% of ATM machines in Europe to protect banknotes. This is the youngest of the three products, although it is already proving to be a useful deterrent and an efficient tool for reuniting crime victims with stolen property. The basis of this material is an adhesive containing a fluorescent compound Tinopal OB, which glows red under ultraviolet light alerting Police to the presence of coded microparticles, which links to a secure database on which the owner is registered . These microparticles are of a resin type material with 5 coloured layers. Each particle is about 50 microns in size, 1/20th the diameter of a human hair. There are millions of encrypted combinations making a code that cannot be cracked or duplicated. It can however be read by Police using handheld scanners, so that there is no need for a laboratory or specialist skills to identify the code. According to Clive Smith of Enigma Tag “ The unique element about Enigma Tag is its ability to literally be read on the spot, and at no additional cost to the Police… In a world where less than 12% of consumers fill in or register their purchases we needed a quick easy idiot proof product that was simple to use and register.” This makes it cost effective and enables property to be returned to owners quickly. As with all these products it is important to place marks where they will be difficult to remove ,and unobtrusive. There is also some advantage to marking in more than one location. The cost of EnigmaTag is £29.99 in the U.K. All materials are non hazardous and stable, although the UV marker if constantly exposed to direct sunlight can deteriorate after about 7-10 years. This is probably also true for the other marking systems. All of these products are effective and have minimal impact on our instruments. Using any of them would greatly decrease the risk of loss and increase the possibility of recovery. However, if you really cannot bear the thought of dabbing even tiny amounts of unremovable glue on to your instrument, remember that thieves are mainly attracted to untraceable goods, unlike violins which they cannot differentiate or value easily. Considering that we are essentially craft workers, there is a surprisingly heavy and regular reading list for those wishing to maintain a well informed view, nor are all publications as cogent as the BVMA Newsletter. The first is .”The Gentle Art of Applied Pressure” by Robert Barclay, Carole Dignard and Carl Schlichting, all of the Canadian Conservation Institute, who are the publishers. Code 0402. $26. 44pp. spiral bound paperback. The aim of the book is to assemble the sort of everyday knowledge that accumulates in disparate workshops but is constantly having to be reinvented because it goes unrecorded, in this case the wide range of tools techniques and materials used to hold objects together while glueing or reshaping takes place. While this is an immensely practical book, it is supported by typical CCI scientific rigour and is clearly and logically presented. The first part examines the application of pressure from a physical point of view. Artificial means of multiplying force, such as levers, wedges and pulleys are discussed, as well as the natural processes of elasticity, gravity, air or fluid pressure and magnetism. Other topics discussed are, distribution of pressure and join topography, including shear, a constant problem with splits in highly arched, poorly quartered instrument fronts. 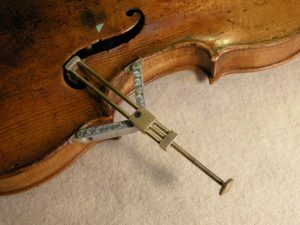 The remaining majority of the book then consists of numerous well illustrated and described examples of solutions to real-life clamping problems, including work on a medieval fiddle, a Lyre, a keyboard instrument, and various percussion instruments. Some techniques such as go-bars and turnbuckles will be familiar, others such as vacuum clamping and using tin plate with rare earth magnets, offer new and interesting possibilities. The great advantage of the book is that it offers combined and accumulated knowledge. It even exceeds the idea that two heads are better than one, by having three authors, who in their acknowledgements thank many for their input, singling out 14 in particular. However, this is a truly interactive book which in its conclusion encourages readers to write in with their own ideas and experiences so that future editions may be more complete. Ideas used will have sources acknowledged, so a good opportunity to share some accumulated BVMA knowledge. The second book is called “The Preservation and Use of Historic Musical Instruments. Display case and concert hall” by Dr. Robert Barclay, senior Conservator at the Canadian Conservation Institute, and is derived from his 1999 PhD dissertation for the Open University, previously only available on disc from CCI. It is not an exaggeration to say that this book examines every aspect of the care of historic musical instruments, but it is not an encyclopaedia. It is more like a précis of an encyclopaedia, dealing with each aspect succinctly and logically, moving on quickly so that ideas are easily sustained and connections and inter relationships made or revealed. It draws together the views of makers, restorers, conservators, musicians etc. examining them dispassionately and without confrontation, so that devoid of rhetoric we examine the rationales and intentions of all concerned with historic instruments. The aim is not to promote one view, but to reveal many and to be honest about these so that better understanding can be promoted. There is a true pursuit of knowledge from which we as readers gain greatly. Having quickly defined a vocabulary of common terms in particular contexts, such as the Historic Instrument, Function, Restoration, Conservation etc, we are then presented with a most useful intellectual tool or framework, which I imagine will be universally adopted by the musical instrument community, for its clarity and utility. Within this framework actions taken on instruments are examined separately but in conjunction with the rationales encouraging them, and both are considered as lying within or without three possible regimens of use. These exceed the usual non productive polarisations of Conservation and Restitution or Restoration, by including the rationale of Currency as a legitimate option. In this regimen, instruments continue in use and are maintained and adapted to suit the needs of musical fashion. Most instruments would fall into this category, but you would expect few Historic instruments to do so. However you would be surprised, and thus it is important to recognise and consider this regimen. The great usefulness of this construct is that actions on historic instruments can be separately examined and compared to the rationale adopted by those performing the actions, total agreement of course being the expected result. However, through the presentation and discussion of a number of real-life case studies, we are gradually brought to understand how difficult it can often be to achieve such agreement. Such is the fair minded and enviable restraint of the author that even the most extreme cases of disagreement are merely described as displaying dissonances. The strengths of this book are that it encompasses a wide and disparate range of views on instrument care and use, presenting these fairly and without rhetoric. It provides a valuable intellectual tool with which to examine not just case histories of other peoples dilemmas, but which can also be used to eliminate some of the woolly thinking we are all sometimes guilty of when confronted by complicated and conflicting instrument care issues. It may provide a valuable restraint in such circumstances, holding back the natural urge to do what we are trained to do, long enough for us to use the mental tools provided, rather than the physical ones, to consider the situation coolly and within a wider context. Most of us will wince a little in reading this book as it recalls past dissonances of our own, but now we have the enlightenment to help us resist repeating them. This book is very well annotated and referenced and includes an appendix chronologically listing events and publications which might have influenced thinking in the field of instrument care, thereby providing useful context for the case studies. To attempt to care for Historic musical instruments without reading this book is to be seriously ill-informed. As well as the range of services you would expect from an established and respected specialist violin shop, Hibernian Violins offers the rare and highly specialised services of a professional Conservator. In fact, Padraig O Dubhlaoidh is currently the only fully accredited specialist Conservator of Stringed Instruments & Bows, in the country. His services are in demand by private collectors seeking advice on Preventative Conservation, large museums and National Conservation bodies with historic instrument collections, small museums with perhaps a single instrument, seeking a Condition Report, and individuals with a treasured instrument, having a historic or even an emotional significance, which they wish to preserve. Caring for such instruments can be a burden, where responsibility is felt towards the instrument, to the person or body with a duty of care, to the public, and to posterity. We can share this responsibility and have the expertise and experience to guide decision making and implement care plans. You have the reassurance that care is given by a professional Conservator, accredited by the Institute for Conservation, bound by its Code of Ethics and Rules of Practice, and listed on the Conservation Register. (Free to consult. www.conservationregister.com ) Let us be your partner in preserving our instrumental heritage. International trade in the timber. 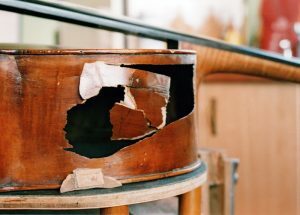 It is hard to exaggerate the seriousness of the situation, which affects violin makers, musicians, and music lovers as much as it affects bowmakers. In other words it affects all of us, and it is up to all of us to do our best to alleviate the situation. In fact, it is only by means of a massive collective effort that we stand any chance of reversing the process of extinction. Jean-Francois Raffin, Doug Raguse, Paul Siegfried and Michael Vann. Each outline was reviewed by at least five of the panel members and either accepted with or without recommendations or not accepted. This process insured a uniformly high standard throughout the book. Authors of accepted outlines then had six months to present finished articles. Then followed the laborious and painstaking process of editing. A very difficult process in a book where the articles are highly technical and written by many authors. All the articles required translation, as like all Canadian publications, this book will be bilingual. There was also a need to make some adjustments to ensure stylistic consistency. This long process (six years) is now drawing to a close and the book is now entering it’s production phase. An amazing thing has happened in the meantime. So many people have been inspired by the idealism and ambition of the project, that they have generously contributed their time, energy and effort, to produce such a number and variety of articles that the “book” now consists of three large volumes, of 1200 pages containing 150 articles by 122 contributors. The books are 9 X 12 inches, the same size as the Weisshaar book, and will include over 1000 black and white and 200 colour illustrations. There is no single secret to making a good violin. There are thousands of secrets to making a good violin. The truth is that just like making any complex structure, success in violin making depends on the individual and cumulative effects of hundreds of tiny decisions made during the process. Playing the violin, or any instrument is very similar. At any moment during a performance, hundreds of questions are being decided, about bow pressure, bow speed, articulation, timing , phrasing, bow direction, shifting, slurring, dynamics, tempo etc.etc. not to mention even more subtle matters of interpretation and style. It’s a wonder any music gets played with so many questions simultaneously on a musician’s mind. The answer of course, lies in the fact that these questions are not fully active in the musician’s mind, or at least not in their “Small mind”, that less than 5% of the mind which is under our conscious control. Our “Big mind” which is that unconscious 95% we trust with the infinite complexities of running our bodies, coordinating our breathing, circulation, nervous and endocrine systems etc. not to mention our even more complex psychological and spiritual welfare; this is the part of our mind that keeps us alive, and to which we turn when we have needs that are important or very complex. i.e. Playing an instrument or making a violin. Just as thoughts are the language of the “Small mind”, instincts and intuition are the language of the “Big mind”. 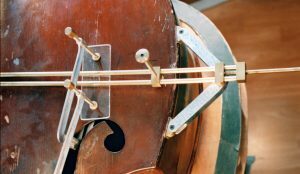 The reason that musicians and instrument makers can function at the high level of complexity that they do, is that they have trained in their craft, to such a high degree that their “Small minds” no longer need to struggle with the mechanical practicalities , which they have long ago mastered. What is needed goes beyond mere physical skill and dexterity, and that can only be supplied by the unconscious 95% of the “big mind” communicating with them through almost imperceptible intuition. Picasso understood this when he said “It took me four years to paint like Raphael, but a lifetime to paint like a child” The four years gave him access to his “Small mind” while the lifetime was needed to allow him to access his “Big mind”. If you think this requires sensitivity, you’re absolutely right. Between 15% to 20% of the population could be classified as Highly Sensitive People (HSPs), which means that they have a neural trait which makes them more aware of subtleties which they then process more deeply than others. (See The Highly Sensitive Person by Elaine N. Aron 1999) . 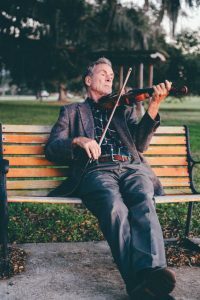 These people have a natural neural disposition which allows them greater access to the subtle language of intuition, which on the one hand grants them great advantages in dealing with complex and subtle tasks like playing music or creating instruments of music, but on the other hand, can sometimes leave them over stimulated and overwhelmed. Artists, scientists and creative people generally come from this group, and if you are alive to the beauty of music, you are probably in this group too. Surprisingly, not every violinmaker has this trait. There are those who constantly seek some simplistic formula or chemical secret, or who slavishly copy every detail of Stradivari’s work, not realising that he varied every instrument in ways that cannot be measured or easily reasoned. I am a Highly sensitive & Intuitive person myself, and I use these abilities every day in my work, to make instruments that sound as musicians wish them to sound, and to restore particular voices to damaged instruments. I have realised that my skills, training and experience will get me quite a long way but if I want to go further I need to access the 95% of my brain that can easily cope with matters too complex for the less intuitive and more down to Earth 5%. From many years of research into violinmaking I have also discovered tangible evidence that the greatest works of Stradivari and Guarneri were also guided by the intuitive skills of these great makers. This also explains why many millions of pounds and years of painstaking scientific research into Stradivari’s work, have failed to produce anything more than plausible facsimiles. What they are trying to measure and quantify is far too subtle to be measured and quantified. It’s like trying to teach a computer to give a musical performance with human qualities. We are indeed strange creatures, for we invest an almost mystical quality to the heart touching tone of a beautiful violin played by a master musician, yet we try to reproduce these qualities mechanically and by computer. Just as great violin playing is a human art, so too is the art of fine violin making. The best violins will always be the result of the combination of skill, sensitivity and intuition of a violinmaker using his 95% capacity, whereas, the mechanical methods of the superficial copyist can only ever reflect the results of a 5% level of human involvement. I am not condemning the practice of copying great works. This is how artists train, and for many years, I too copied every fine instrument that came my way. However, there comes a point when you cannot progress further through copying. After all, how do you copy the subtle, almost intangible instincts of another person. We can only follow our own instincts, and if we want to make the finest instruments we can, there is no other way. This is the greatest difference between a copy and an original. The original is guided by the instincts of the maker, whereas the copy lacks this human “soul” aspect. If great violin making contains any “secret”, this is it.